Got a killer dog? You could be charged with murder. Laws are cracking down on dog owners who knowingly keep dogs with a history of aggression. This should be a wakeup call for people who insist on owning dangerous dogs. Owners of aggressive dogs need to be held accountable for dangerous attacks. Dogbites.org has the most recent statistics regarding dog bites and laws. It remains a fact, that Pit Bull type dogs are disproportionately represented in the number of bites and attacks on pets and people each year. Many of these attacks, which are sometimes fatal, are preceded by a record of aggressive history. If more states enact laws to hold owners accountable for their aggressive dogs, perhaps people would take their dog-owning responsibilities more seriously. Dogs with documented histories of aggression are most likely to get their owners charged for murder. Any aggressive act perpetrated by a dog should be reported to animal control immediately. Establishing a recorded history of violence is the first step in charging an owner with murder. If the owner is aware of the dog’s aggression, that can be likened to intent. Owners with aggressive dogs must exercise additional care and caution in the management of their potentially deadly pets. Perhaps, if more dog owners were charged with murder, people would be more careful with the ownership and management of dangerous dogs. Even as puppies, bird dogs tend to point. Even those bird dogs raised in non-hunting homes frequently show an interest in ducks and other fowl when being walked near lakes. It is unacceptable for owners of traditionally aggressive dog breeds to blame dangerous behavior on the way a pup is raised. Dogs that were bred for fighting continue to show an interest in fighting no matter how they were raised. Rachel Ray’s Pit Bull, Isaboo, has attacked other dogs multiple times. Everybody can agree that Rachel Ray isn’t pit fighting Isaboo against Michael Vick’s dogs when she’s not cooking it organic, gourmet meals. Any dog can bite. Pit Bull bites are especially damaging because of their lock and shake technique. The tissue damage inflicted during Pit Bull attacks has been likened to that of shark attacks. Rachel Ray’s Pit Bull Isaboo recently attacked another dog, ripping its ear off. This is not the first incident for Isaboo. Isaboo now has a record of aggressive behavior. If she harms or kills a person, Rachel Ray can kiss her empire good bye. She could potentially loose all of her assets in a wrongful death suit. In addition to lawsuits, she should actually be charged with murder. Given Isaboo’s documented history of aggression, Rachel Ray could easily be charged with murder, and possibly even convicted. Isaboo has yet not shown aggression towards people. If a person were to interfere with Isaboo during a dog fight, she could easily turn the aggression towards them. It is well known that breaking up dog fights is incredibly dangerous for humans. Many dog owners would certainly jump to their own dog’s defense if Isaboo were ripping its ear off. Isaboo has a well-documented record of aggressive behavior. Rachel Ray should exercise great caution in the management of her dangerous dog. If people insist on owning dogs with a breed history of violence they should take extra care in being vigilant owners. Owning a Pit Bull type dog is a huge responsibility. Even dogs that were raised in good homes with no history of dog fighting or violence have been known to show high levels of dog aggression. Many people that own Pit Bulls will often say that they don’t get along with other dogs. Dog aggression is a slippery slope towards human aggression. Anybody who has ever tried to break up a dog fight knows this. Pit Bulls, in particular, are known for their seemingly friendly disposition prior to attacks. A wagging tail does not mean safety when a Pit Bull is approaching. It remains to be seen if harsher laws regarding the ownership of dangerous dogs will help to reduce fatal attacks. Many people often state that the dog’s upbringing is what determines its behavior. This is an irrational argument. 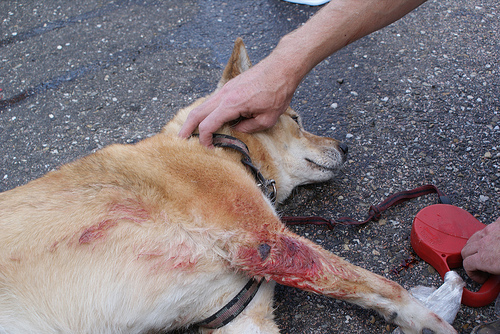 Many fatal dog attacks have been perpetrated by family dogs. Many of these attacks have even been turned on loving owners. If Rachel Ray’s dog can show such a predisposition for violence, so can any family dog. Dog owners in particular should exercise great caution in the management of notoriously dangerous breeds. Kristen Bright is a creative writer at Instant Checkmate in San Diego. Please follow the Instant Checkmate LinkedIn Page to see more of her work, or contribute to the Instant Checkmate CrunchBase profile.